If you are looking for a fun way to give your Valentine a sweet treat, this DIY Valentine’s Day treat jar is the perfect idea. Made from a few simple craft store supplies, this treat jar is perfect for the owl lover in your life. 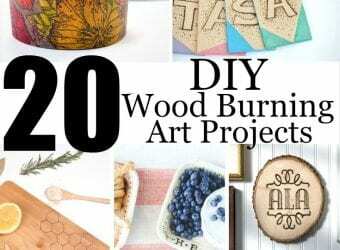 While it looks like something out of a fun, handmade boutique, you can actually whip this up in minutes. 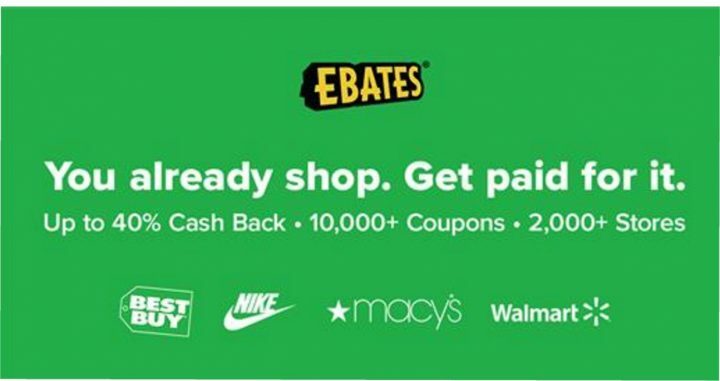 Take a peek below for the instructions! 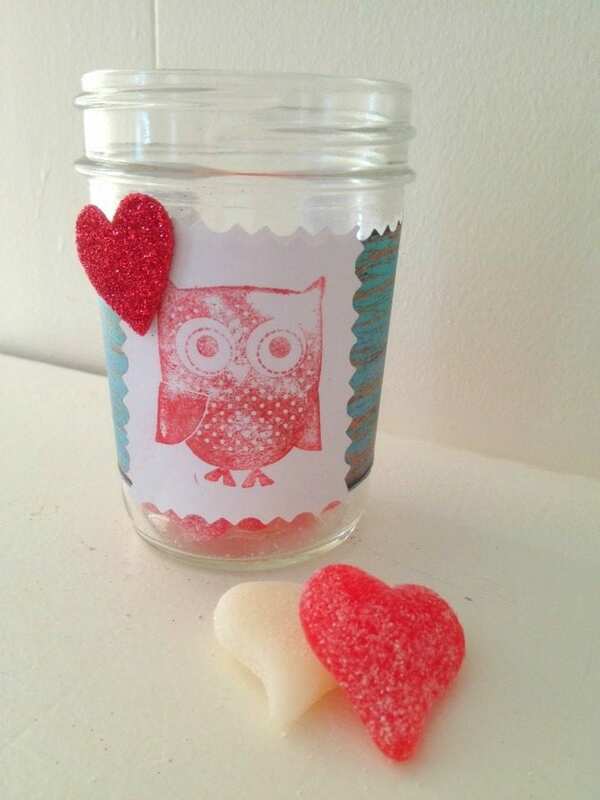 We hope that you love this DIY Valentine’s Day Owl Treat Jar. 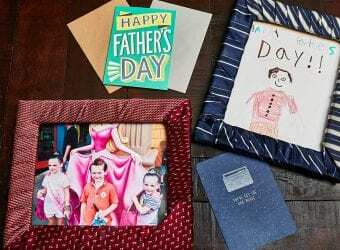 Begin by cutting a thick, 2 inch strip of scrapbook paper (we choose a teal wood grain) and wrap it around your glass jelly jar. Use a dab of glue on the ends of the strip to secure it to the glass. Next, press your owl stamp (after you rub it firmly on the red ink pad) to a piece of white craft paper. Use your scissors to cut the stamp design out in a square shape. Glue the owl embellishment to the front of the jar directly over the scrapbook strip. Add some of the red foam heart stickers. We kept our detailing simple by just sticking one heart up near the top corner. You can of course layer on as many as you wish. 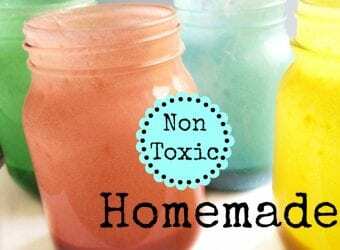 Now all you need to do is fill your jar with colorful treats and screw the lid back on. 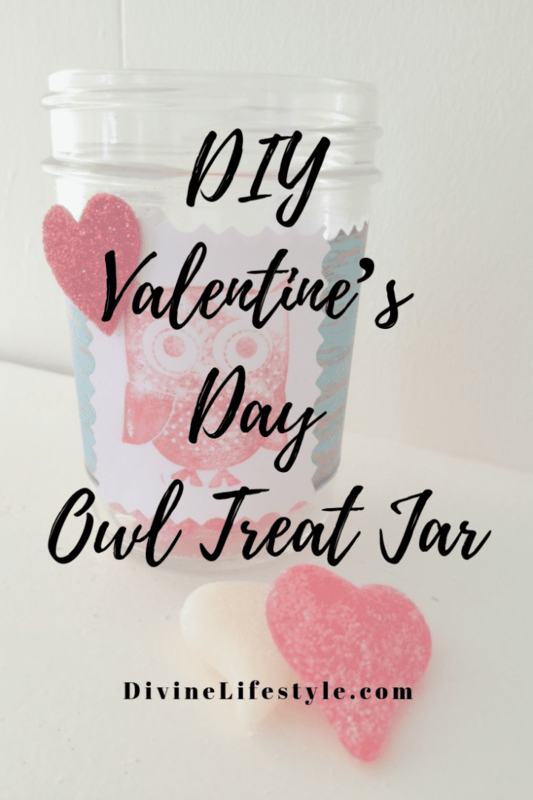 You can add further detailing if you wish such as ribbon or fabric around the lid, however we kept our Valentine’s Day owl treat jar simple for a more rustic and handmade look. We were able to find all of the supplies we needed at our local craft store. Head to your local craft store and get the supplies you need to give this treat jar a try! It is sure to be well received! 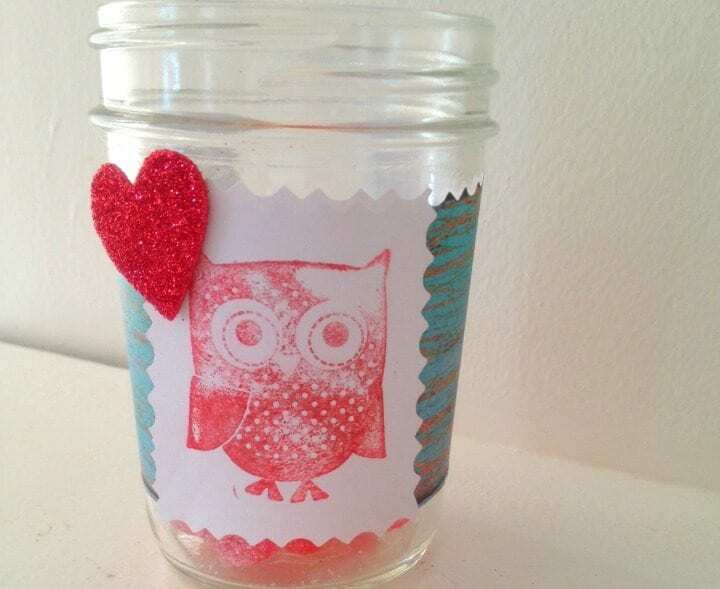 We hope that you loved this DIY Valentine’s Day Owl Treat Jar. Happy Valentine's Day! This is a cute idea, and the red heart foam stickers are a really neat touch!